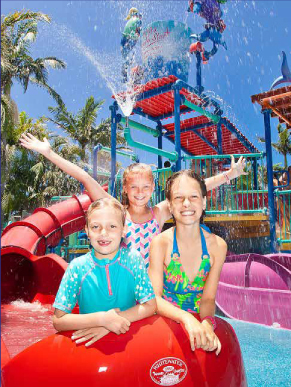 North Star Holiday Resort situated on the pristine Tweed Coast is your answer to the perfect venue for your next camp, conference, event, family reunion or special celebration. The North Star team can design a flexible and affordable package to suit you, your guests, delegates or colleagues, with room hire, accommodation, dining and team-building, as well as all your conference requirements. 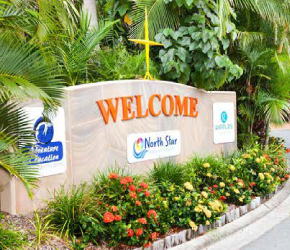 Welcome to North Star Holiday Resort, an award-winning haven located on the pristine Tweed Coast, approximately 90 minutes from Brisbane CBD and 50 minutes from the heart of Surfers Paradise. 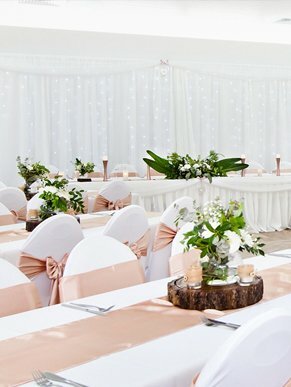 Our Group and Functions Coordinator provides excellent service and will look after every aspect of your stay, to ensure that your event or function is a huge success. 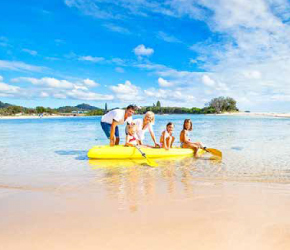 North Star Holiday Resort offers it all! 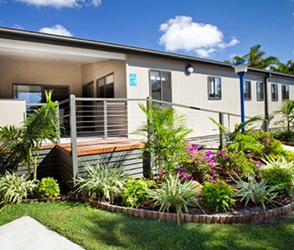 Accommodation includes fully self-contained villas and cabins, powered sites, and everything in between. 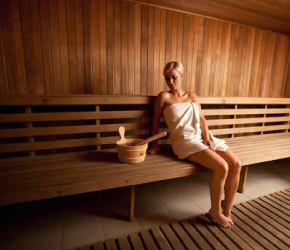 Escape the hustle and bustle, enjoy our serene location, and really take time to focus on what’s important. Fully licensed café, two heated pools, water slides, splash park, marine museum and a leisure centre featuring lap pool, 3 spas, sauna, gym, massage rooms and even a hair salon! 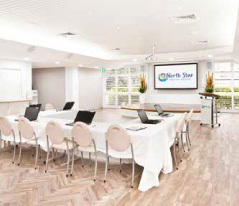 Get Together – North Star is the ultimate business destination, with fully-equipped conference and meeting space, a peaceful and relaxed atmosphere, and friendly and accommodating staff to assist in every possible way. This private, fully air-conditioned venue can seat 80-100 people in comfort. Room hire includes use of all AV equipment & connection to WiFi. Ripples Atrium is a light and airy semi-private section of Ripples Café which can be reserved for private dining or functions. Suitable for 40-50 persons. 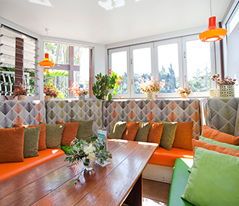 A modern ‘nook’ within our fantastic Ripples Licensed Cafe. Perfect for morning tea or a light lunch for a few people. 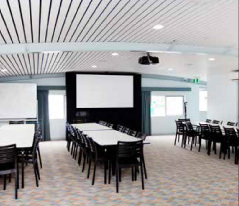 A great informal meeting venue for up to 10 persons. 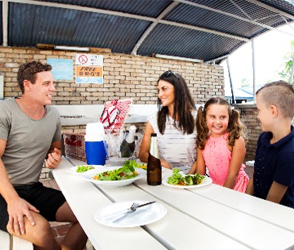 Our newly refurbished all-weather BBQ area is great for large social gatherings and is open for use by all park guests. 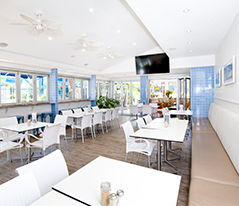 This carpeted, air-conditioned space is the perfect choice for smaller, casual functions. Max 80 people. Put simply - absolutely awesome. I think it's the best venue we've had. They were very helpful and professional. Thank you for all the work you put in to our event. It was very successful. All in all it was a fantastic experience booking this venue from start to finish The night went off without a hitch much thanks to your amazing help and organisation. The guys at reception Friday / Saturday also very accommodating, nothing was too hard while we were setting up, everyone was so very helpful. The venue was perfect, everyone commented. The food was absolutely amazing and the staff on the night were very cooperative pleasant and not intrusive in any way. All in all it was a fantastic experience booking this venue from start to finish and I have already recommended it others. This resort is a cut above what you would expect. We are so pleased we chose the North star for our family reunion. This resort is a cut above what you would expect. We also hired the Function Room which was set up beautifully for our Luncheon. We were surprised by the generous servings at reasonable prices. Our group of over 30 found North Star to be the perfect choice. All the staff were exceptional which added to the overall success of our reunion. We highly recommend this resort.